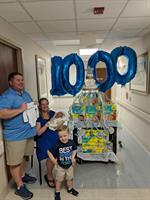 Bayfront Health Port Charlotte announced today that the 1,000th infant born at Bayfront Baby Place in 2018 was born at 11:23 p.m. on December 26. Although close, the last time Bayfront Health Port Charlotte had more than 1,000 births in a given year was 2015. Delivered by Ruben Guzman, M.D., obstetrician and gynecologist with Bayfront Health Medical Group, baby Wyatt weighed 8 pounds, 12.6 ounces and was 19.25 inches long. Both mom and baby are doing well.